Kinkakuji or "Temple of the Golden Pavilion" is a Zen Buddhist temple in northern Kyoto, Japan. 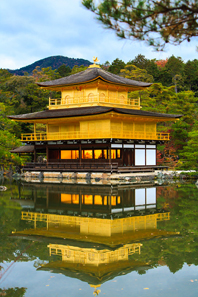 The Japanese term Kinkakuji means the temple of the Golden Pavilion. Rokuonji (Deer Garden Temple) is the formal name of the temple complex in which the Golden Pavilion is located. Kinkakuji is set in a magnificent Japanese strolling garden and it extends over a large pond called Kyoko-chi (Mirror Pond) that reflects the building. The garden complex is an excellent example of Muromachi period garden design. The Muromachi period is considered to be a classical age of Japanese garden design. In Kinkakuji's history, around 1397, the villa was purchased from the Saionji Kintsune, a powerful statesman by Shogun Ashikaga Yoshimitsu and it was transformed into the Kinkakuji complex. When Yoshimitsu died, the building was converted into a Zen temple by his son, according to his wishes. Kinkakuji is an impressive structure built overlooking a large pond and is the only building left of Yoshimitsu's former retirement complex. The Golden Pavilion is a three-story building on the site of the Rokuonji temple complex. The top two stories of the pavilion are covered with pure gold leaf. Each floor of the Kinkakuji represents three distinct styles of architecture which are shinden, samurai, and zen, specifically on each floor. The first floor was built in shinden-zukuri style used for palace buildings during the Heian Period. Statues of the Buddha and Yoshimitsu are located on the first floor. The second floor was built in the style of buke-zukuri used in samurai residences. The second floor also consists of a Buddha Hall and a shrine dedicated to the Kannon Bodhisattva. The third floor is built in traditional chinese Zen style, also known as zenshu-butsuden-zukuri. The roof is in the shape of a pyramid. The building is topped with a golden phoenix. Kinkakuji is one of 17 locations which comprise the Historic Monuments of Ancient Kyoto World Heritage Site. Being one of the most popular ancient buildings in Japan, it attracts a large number of visitors annually. Osaka's Kansai International Airport is the closest international airport to Kyoto. Osaka International Airport or Itami Airport is the primary domestic airport for the Kansai region of Japan. The hotel is located atop JR Kyoto Station, providing direct and easy access to and from Kansai International Airport and major destinations. It is located in the heart of Kyoto and is within walking distance to many popular sites and facilities. Hyatt Regency Kyoto is located in the traditional and historic area of Higashiyama Shichijo, in the heart of Kyoto, Japan and just a few minutes away from JR Kyoto Train Station. The local attractions are within short distance from the hotel. The Kyoto Brighton Hotel is located near the quietness and tranquility of Kyoto Imperial Palace. It is situated in the cultural center of Kyoto and just minutes away from the famous business and entertainment districts of Gion and Kawaramachi. Nearby sightseeing attractions include the Nishijin textile district and Nijo Castle.